A Durango woman has been cited for entering Kelly’s Cowboy Co. on Friday and ripping down a sign, similar to this one. The sign says the store is a location where people can sign the petition to recall La Plata County Commissioner Gwen Lachelt. 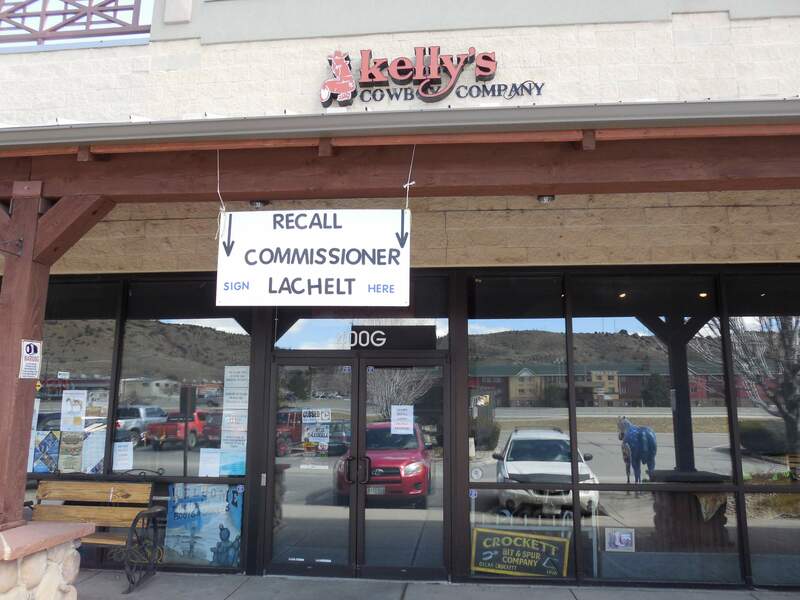 Kelly’s Cowboy Co. on South Camino del Rio displays signs that say the store is a location where people can sign the petition to recall La Plata County Commissioner Gwen Lachelt. 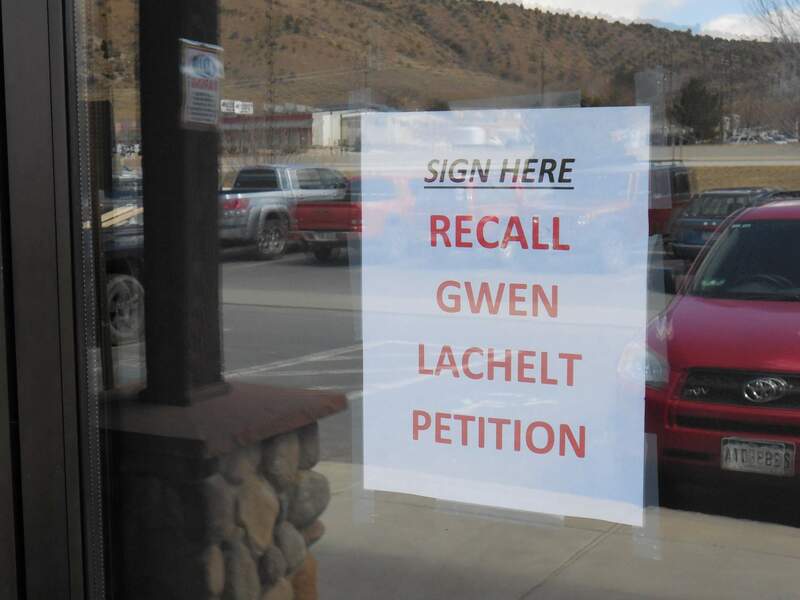 Police have cited a Durango woman for destroying a sign that asked for signatures in the effort to recall La Plata County Commissioner Gwen Lachelt. Durango Police Cmdr. Ray Shupe said officers received a call around 4 p.m. Friday that a woman had entered Kelly’s Cowboy Co. at 400 South Camino del Rio and destroyed the sign. The woman was identified as Mary Frenette, 61, of Durango. Frenette declined to comment for this story. Kelly’s Cowboy Co. owner Kelly Nagel did not return calls seeking comment. Shupe said the business’s owner told police officers that a woman was walking by the store when she opened the door, reached inside to tear down the sign and then ripped it. The woman then walked away. Owners of the store were unable to make contact with her. The store then put up another sign in its place asking for signatures for the recall. A little later, Shupe said, the woman, who was walking back to her vehicle after having lunch next door at Zia Taqueria, attempted to reach inside the store and grab the new sign. “It looked to them that she was coming back to rip the other sign, so they confronted her at the door,” Shupe said. The woman left the scene, but police were able to identify her through pictures and video taken by Kelly’s Cowboy Co. When officers contacted Frenette, she admitted to destroying the sign because “she got upset when she saw it,” Shupe said. Frenette asked officers to allow her to call and apologize to the owner of Kelly’s Cowboy Co. before moving forward with citing her. Shupe said even though Frenette apologized, the owners of Kelly’s Cowboy Co. wanted the woman to be charged with a crime. The citation is for malicious injury to property, which is a municipal violation of city of Durango laws. Attempts to reach officials at the city of Durango to find out what the penalty is for such a citation were unsuccessful.